Jewelry is an item of everyday life that has a larger significance than many people realize. We use jewelry to add an extra dazzle to an outfit, whether it be in the form of a bracelet, earrings, cufflinks, or even a watch. These beautiful concoctions of rare gems and diamonds being held by high quality gold, platinum or silver are very costly regardless of their small size. Rings are used on a daily basis as a way for a man to ask a woman to spend the rest of her life with him. These rings represent the eternity of love and a bonding commitment you make to another person. They not only have a large price tag, but they can also hold a large personal attachment and meaning as well. So which companies are among the most elite and luxurious brands of the world? 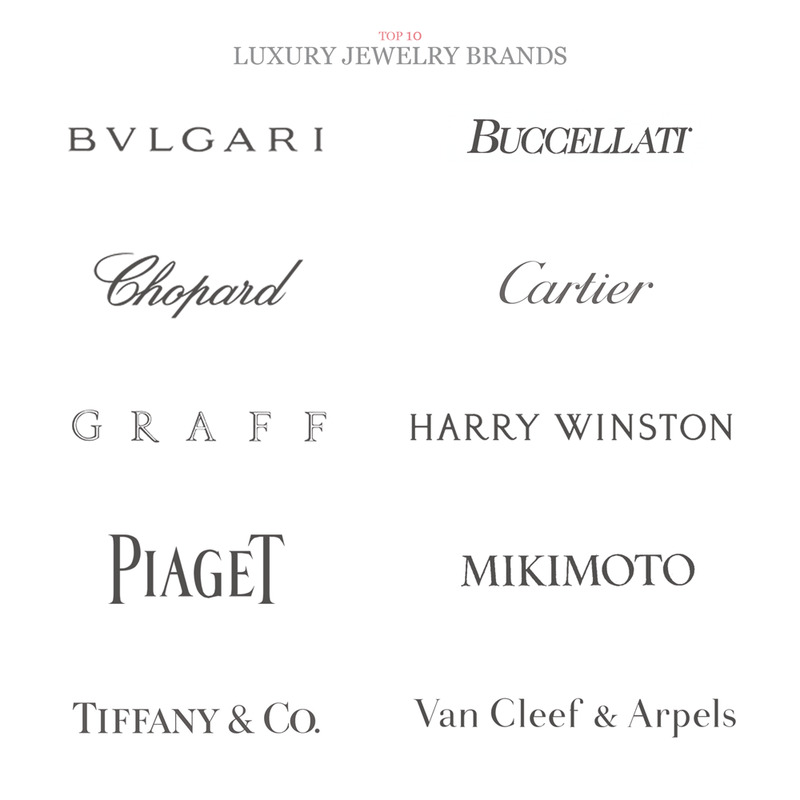 Take a look and see if your own jewelry comes from one of these 10 luxurious brands. Kokichi Mikimoto began his business in 1893 Japan. He’s widely known as the inventor of cultured pearls, which appear with great frequency in his collections. Mikimoto jewelry consists of only the finest ocean fruits: rare South Sea pearls, pink conch pearls, Titian pearls, white pearls, etc. Plus, the brand uses only 18 karat gold or platinum; high quality VS, G color or better diamonds, all natural colored gemstones, and the finest silk thread to string pearls. Each piece in the Mikimoto line is singular. Simple elegance characterizes a unique design, or a classic shape with a new twist. A typical Mikimoto piece is pared down to one or two types of stone. After all, the purity of the pearl itself is of the utmost importance to the brand. Most Mikimoto jewelry can be worn day and evening. The house also comes out with quietly elegant statement pieces, such as the Empress Necklace shown above. Since its founding in 1884, Bvlgari has been a leader in the world of fine jewelry. The house is based in Rome, where it comes out with elaborate pieces that mix traditional styles with innovative designs. Some of Bvlgari’s hallmarks are bold shapes, large pieces, cabochon stones (a legacy of 1960’s Italian glamour), brightly colored floral and fruity motifs, and classy Italian staples like chokers, bangles, and cuffs. Bvlgari uses the finest gems and mostly 18 karat gold for its discerning clients. Many Piaget designs are modern and sleek, with strong angular lines and a sense of movement. Motion also comes into play in their luxurious watch designs. The brand offers some of the world’s most ingenious openwork dials and watch faces that can be adjusted and worn at different angles on their bands. Graff is known for top quality and service, which has made the brand popular among the wealthy. However, what sets Graff apart from other elite jewelers is the enormity of its stones. Laurence Graff himself has said that large stones, especially huge diamonds, are what he is all about; and his decision to expand globally to meet increasing demands for bigger stones has made him the billionaire he is – that and the fact that he operates a wholesale business with no middleman to pay. Look for Graff’s soon-to-be-released coffee table book, The Most Fabulous Jewels in the World ($150), which covers the brand’s history and legendary jewelry. Mr. Graff coined the title, which reflects the grandiosity of his style and personality. Tiffany is one top luxury brand that’s also a household name. It offers a great deal of jewelry that’s wearable during the day and for many occasions, including items for men, women, even children. Quality certainly lies behind Tiffany’s fame. Its gold and silver are stunning and shiny, and its stones are flawless. Only the best materials are used for its pieces, whose every detail is precise and refined. Although Tiffany’s modernity and simplicity are inseparable, the house has been selling classics ever since its founding in 1837. You will find, for example, the pavé diamond bangle bracelet, the basket weave bracelet, and the heart pendant. What sets such staples apart, however, is their refinement. The tactile nature of its highly dimensional designs is also what brings whimsical motifs (flowers, birds, etc.) to life. The House of Tiffany has long prided itself for its ultra luxurious (and priciest) statement jewelry for elite clients: one of a kind, gem intense showstoppers that often take a master artisan years to complete. Buccellati is known for the impeccable quality of its Italian gold. True to its heritage, house designers adhere to Roman styles, such as the cuff bracelet, but reinterpret them through lacy carvings that look soft from afar. The house also gives jewelry a fabric effect by brushing and mattifying metals, and it often mixes silver and gold for texture and light enhancement. Dense gem encrustation, likewise, gives much of Buccellati’s jewelry its rich texture. Van Cleef and Arpels resulted from the collaboration of Estelle Arpels and Alfred Van Cleef. Originally based in France, the house still stands for Old World elegance, but Van Cleef jewelry is in a class of its own. It’s inspired by the ethereal, by nature’s spontaneity, fleetingness, and ever-changing quality. Hence, much of its jewelry is fluttering in appearance, and evokes movement through ingenious designs and subject matter. The Van Cleef website expresses nature’s liveliness and ethereality through its animation and videos showing jewelry traveling through landscapes. There is a metaphorical and narrative element in much of Van Cleef’s jewelry that marries the technical difficulty of its intricate designs and stonework. Van Cleef continually comes out with pieces bearing birds, flowers, and animal motifs. For instance, the Oiseaux de Paradis (Birds of Paradise) earrings shown above pay homage to Van Cleef’s love of plumage and the bird as a symbol of movement. When hanging side by side, one on each ear, the bird on the right seems about to put a fruit (a juicy amethyst stone) into the mouth of the smaller bird, whose lower position evokes acceptance. The gemstone tendrils they suspend from are fruity vines. The house’s top quality watches come in different styles from simple to ornate. The most luxurious dials have gem-inlaid scenes and motifs that evoke time’s passage and precious moments to be remembered. The Duchess of Windsor was so enamored by the house’s signature panther, a model of Cartier’s superb sculptural fluidity and dimensionality, that she ordered several pieces with the motif. Most famous is her 6.5 inch diamond, onyx and emerald bracelet, which recently sold for just over $7 million. Renowned for his classic but grandiose diamond jewelry, Harry Winston ranks at the top, where he has been since the height of his career. Winston founded his company in 1932 by acquiring and selling estate jewelry, a line that is still vital to the Winston brand. Only the finest quality and rarest stones are used for Winston jewelry. Each piece is put together with master craftsmanship that guarantees durability. It’s no wonder many of the most famous and coveted luxury jewels bear the Winston name. Each treasure is unique in its elaborate design and many of his works have a history, including Red Carpet pedigrees. Come in to luxamart Jewelry today for the greatest value for your holiday jewelry needs! We buy, sell and repair and clean diamond rings, gold, silver, platinum and coins to help with investment. We also sell and buy and repair jewelry, luxury watches including Invicta, Engagement rings, necklaces and much more. We are located in booming frisco, TX at Lebanon and Preston Rd. Jewelry Buying Tips for the HolidaysHow is the jewelry industry is changing with technology?